How can citizens go beyond everyday food choices to create a healthier food system for all? Founder of the Fair Food Network Oran Hesterman discusses the importance of engaged citizenship. How can we encourage people to think more systemically when it comes to food issues? Oran Hesterman: With most large systems, such as education and energy, we must rely primarily if not solely on our policy makers and industry leaders to act on our behalf. We can write letters, attend meetings, and try to make our voices heard on local and national levels, but in the long run, there is little that one individual, family, or neighborhood can do to fix the broken system. With the food system we can have more impact. We can take responsibility for fixing it both through individual decisions and through collective action. 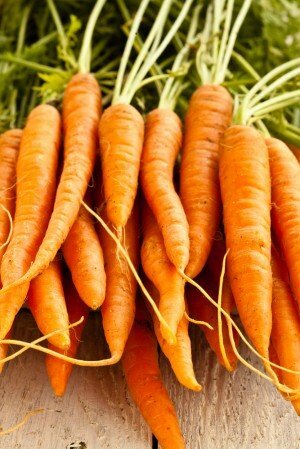 As individuals we can make different choices about what we purchase and what we eat. We can choose to support a more local and sustainable agriculture and can decide to eat in a way that keeps us healthier. We can join with other concerned individuals to demand different food at our children’s school cafeteria and at our college food service. We can plant backyard and community gardens. We can shop at farmers markets. All of these individual actions can and will make a difference in our own lives and in the food system, but they alone will not produce the kind of change we need. We also need our policy makers and industry leaders to work toward a redesigned food system, one that provides safe, healthy, and nutritious food to all our residents in a manner that protects our natural resources for future generations. As is the case with healthcare, energy, and the environment, if we’re going to solve the food problem we need to look at bigger, systems-level solutions. What are the practices of an engaged citizen when it comes to fair food? 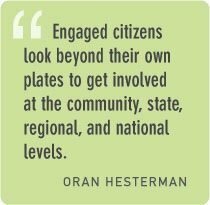 Oran Hesterman: Engaged citizens look beyond their own plates to get involved at the community, state, regional, and national levels. Whether they participate in a community assessment or food policy council, join a farmland preservation organization, or advocate for local sourcing by institutions that touch their lives, they are helping to fix the broken food system. If you are ready to engage further, consider putting your efforts into the policy arena. 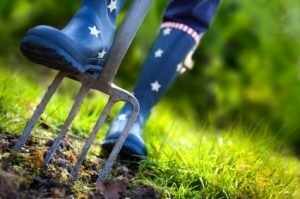 There are multiple ways of doing that through community organizations and faith-based groups, local and statewide food policy councils, regional Sustainable Agriculture Working Groups and organic farming organizations, and national organizations such as Community Food Security Coalition, National Sustainable Agriculture Coalition, and Slow Food USA. What does the food movement mean to you? Oran Hesterman: A few years ago, it would have been hard to identify the interest in food systems change as a “movement.” I sense that is rapidly changing. As I travel across the country introducing my book to audiences, in every case close to half the people present are in their twenties or thirties. The fair food movement seems to be catching on as the movement of this time. It comes at a moment when the symptoms of our broken food system have never been more severe, and in which we have the knowledge, resources, and leadership in place to make a significant change. In 1988, it would have been nearly impossible to find a political analyst predicting the fall of the Berlin Wall. Yet, a point occurred in 1989 when enough activists had been at work with their tools that the political infrastructure and the foundation of the wall were sufficiently weakened, and the wall came tumbling down. In the same way, we have had food systems activists chipping away at the current broken food system for many years. Countless farmers, gardeners, leaders, students, teachers, writers, politicians, businesspeople, academics, and moms and dads, with the equivalent of chisels and hammers in their hands, have been challenging the current food system brick by brick. Every time someone decides to get their food at a farmers market, establishes a small-scale organic farm, or develops a new sustainable supply chain for their company, they are attempting to change the current system, one step at a time. Just as we will never know who removed the actual brick that caused the Berlin Wall to collapse, we don’t know which specific innovation will serve as the tipping point for change in the food system, but it will happen, sooner or later. My fear is that we don’t have enough time to wait. Can we let another generation or two go by before we have sufficiently redesigned the food system to ensure a sustainable future for our progeny? I think we need to act more directly and forcefully now. Read more from Oran Hesterman in Fair Food. Dr. Oran Hesterman is president and CEO of Fair Food Network, a nonprofit organization working to guarantee access to healthy, fresh food, especially in underserved communities. He is the author of Fair Food: Growing a Healthy, Sustainable Food System for All. A national leader in sustainable agriculture and food systems, he co-led the Integrated Farming Systems and Food and Society Programs for the W.K. Kellogg Foundation for 15 years. Before 1996, he researched and taught in the Crop and Soil Sciences department at Michigan State University in East Lansing. He earned his doctorate at the University of Minnesota, in agronomy, plant genetics, and business administration. He currently lives in Ann Arbor, Michigan.